You may have some sleepless nights, but being your own general contractor can help ensure you get exactly what you want. There is no mystery to being a general contractor, though some skills with peo­ple, finances, and general good sense are required. For someone who has never done it, a willingness to ask questions, some of which may seem elementary or even silly, is necessary. And a knack for solving problems is certainly helpful. I wouldn’t recommend that a novice act as his or her own contractor if the job is large—say, a new house or a large addition—but an interior remodeling of moderate size can be quite manageable. Yet that still begs the real question: It isn’t Can I do it? It’s Should I do it? The best argument for trying to be your own contractor is the payoff. Con­tractors are, after all, in business to make a profit, so adding 20 or 30 percent to the cost of materials and labor as profit is perfectly reasonable. If you are your own GC, you don’t have to pay anyone that percentage. On the other hand, there are arguments against being your own contractor. For example, if you aren’t satisfied with the finished product, you can’t complain to your GC that the job isn’t good enough and refuse to make the last payment. You would be talking to yourself because you are the general contractor. That may be the biggest single reason not to be your own GC. If you hire someone to do the job for you and then something goes wrong, it probably won’t be your problem because GCs are paid to solve problems and get the job done. When you hire a general contractor, you are paying for his experience, competence, ability to anticipate problems, and, more than anything, for his willingness to assume final responsibility for the whole job. And he’ll get the permits, do the scheduling, and handle disputes between subs and suppliers. So if you opt to do the GC’s job, you’ll have some sleepless nights. Should major problems arise, you won’t have the same simple recourse to call your lawyer and tell him, “Sue the damn GC, it’s his fault.” Acting as your own contractor does not mean buckling on a tool belt and swinging a hammer all day. Being your own contractor can mean you increase the odds of getting exactly what you want. GC’s make money by executing each job simply and efficiently so they can get on to the next one. Changes along the way and variations from the usual that make a job last longer can be the cause of irritation and uncooperativeness from a GC. Thus, if you are very detail conscious and plan to be looking over everybody’s shoulder anyway, it may make sense for you to be your own GC. According to a 1996 survey conducted by the Consumers Union, roughly half of the reader respondents used a GC to oversee their renovations. The degree of sat­isfaction was roughly the same for those who did and those who didn’t. Perhaps the average Consumer Reports reader is more careful and savvy than the average person … but perhaps you are, too. Now let’s talk about the key elements of the job. This will be your responsibility, and it’s a crucial one, since these are the ladies and gentlemen who will actually remodel your house for you. They’re the carpenters, plumbers, electricians, and other tradespeople who translate the plans into your living spaces. As with any manager, the key skill is find­ing the right personnel. The most important player will probably be your carpenter. He’s the person who will shape the structure that defines the spaces. He builds the framework that will be the matrix for the electrical wiring, piping, vents, phone lines, and insulation. He’ll return after all that has been roughed in and cover it with finished surfaces. The carpenter is the pivotal player and should be hired first. The carpenter will be your primary sub, so ask him for help in finding an elec­trician, plumber, or mason. And don’t worry too much about cronyism here. Most carpenters can be counted on to recommend people they like to work with but few will recommend subs who don’t know their jobs. They know which are the guys who mess up the schedule and who do sloppy work and make trouble for everybody else. They don’t want those headaches any more than you do. To find carpenters or subcontractors, ask friends and neighbors. The Yellow Pages are a good source, too. Another option is to visit job sites in nearby residential areas. Walk right in and ask for the head carpenter, plumbing contractor, or the elec­trician. The chances are excellent that you’ll come away with a business card, a phone number, or possibly an appointment. You may even get an estimate on your job if you have the plans with you and the boss has an hour to kill. Another good source of subs is supply houses. Ask at plumbing, electrical, or tile shops that deal with the trades. You should get a couple of names. Ask other subs for the names of the tradesmen they respect and with whom they’ve worked. Check each sub’s references (customers, suppliers, banks, and others). Get several subs to estimate on the big jobs and at least two on the small ones (replumb- ing an existing bathroom durtng a remodeling is a small job, plumbing two new baths, a laundry room, and a hot tub in a large addition is a big one). Do your home­work on the people you are hiring before you hire them. When it comes to dealing with subs, keep in mind that most of them bid a lot of jobs and some take on virtually every one they are offered. The bad news is that you, as a one-time customer, may get a place toward the bottom of their priority list, well below the GC’s who are going to be building many houses in the future and therefore may be continuing customers for the subs’ services. You need to steel yourself for the frustrations and scheduling hassles but, on the other hand, you’re not taking on the world all alone. Your subs will also be key allies in getting your job done. They are there not only to get your house built, but to help you do it. You may be surpnsed to find the pride that many individual operators in the construction business take in their work. Try to use that pride and spirit to your advantage. Good planning on your part and constant communication with the vari­ous subs are both essential. Many states and municipalities require that general contractors be licensed and properly insured before they can legally hang out a shingle identifying them­selves as GCs. However, no such requirements exist for the homeowner acting as his own GC. If after you do it yourself you like it so much you want to do it again for someone else, then you can find out what the requirements are. When you act as your own GC, you’ll need a builder’s risk or fire policy. In most states, prices tend to vary only slightly from company to company because they are usually closely regulated, but check with the insurance agent who handles your homeowner’s policy to determine the paperwork required and the cost. 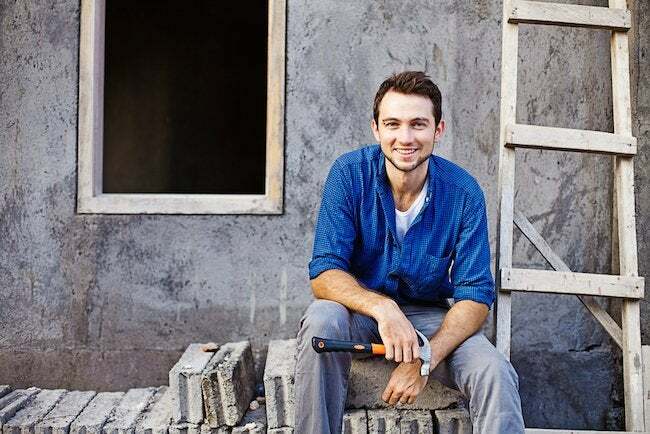 You will want to arrange for the insurance to be effective the moment the building materials arrive or the first worker sets foot on the site, whichever is earlier. If you have a construction loan, the bank will probably insist you have a valid insurance binder on hand at the time you close on the loan. When the work is finished, you can then amend the policy once again to standard homeowner’s coverage. Don’t take the decision to be your own general contractor lightly. Don’t let the possibility of saving a substantial amount of money blind you to the potential for complications and conflict. You may find a great deal of satisfaction at having man­aged the whole process yourself, but you should also be confident that you have the time, interpersonal skills, organizational abilities, and just plain desire to stay the course, even when the going gets a bit rough. And it will—no construction project is without its ups and downs, its setbacks and frustrations. For many people, the markup a GC adds to the actual costs of construction is a fair price to pay to man­age the process. There is a potential for savings, but there must also be an invest­ment on your part of time and commitment. You’ll have to coordinate the activities of the subs, establish schedules, pay bills, and perform a number of other functions. But there’s another role you will have to assume as well. As GC, you’re the person with the “buck-stops-here” sign on his desk. The decisions, large and small, are yours to make. There’ll be professionals around to help answer questions and advise but, finally, yours is the voice of authority. No, it isn’t a full-time job. You probably won’t need to spend more than two hours a day during construction. Yet you must be on call for surprises and emergencies. Is your workplace close enough to your home and is your schedule flexible enough that you can make the trek to the job site during working hours? How about at lunch hours? Are you accessible by phone most of the time? Don’t take on the job of general contractor on a whim. You probably won’t be able to hand it off to someone else partway through without costing yourself most of the money (or more) you were hoping to save. All right, now let’s really talk. You will have to be a manager. That means you will need to be tough at times with your subs. Yet you can’t interfere with their work. It’s a fine line. Do you have enough patience, critical distance, and savvy that you can both let the pros do the work they know how to do better than you yet know instinctively when to step in? Who Should You Hire to Manage Your Construction?